Antique Autos | Real Art Is Better! Each year my brother’s family hosts Thanksgiving dinner. I am fortunate to have a large family, and this year we had 24 guests! I was personally responsible for the dinner rolls, so the previous night I made a huge batch of dough and left it on the counter to rise overnight. In the morning the dough was prime for shaping into rolls, so the first thing I did was shape 48 dinner rolls and left them to proof on the baking sheets. Then I went into my studio because working as an artist full time means that I work pretty much every day, even on holidays. I was working on a painting of a Mustang and listening to NPR, which was focusing on consumerism discussions and commenting on Black Friday starting on Thursday this year. I kind of laughed as my painting of a vintage muscle car reminded me of American consumerism. I had to stop a few hours in as my wife needed to roast a duck as a supplementary bird (for the deconstructed turducken), which meant that I had to bake my buns first. This took an hour as I had four sheets of rolls to bake. Then back in the studio to finish the Mustang painting. Then I rolled out the yoga mat and prepared to run 5 miles, just enough to build an appetite. Then we loaded up the old pickup and rolled to my brother’s house. The food was awesome and I sampled some amazing beers. We not only had duck, but also ham, and prime rib, as well as turkey! What a feed! Then for the entertainment! 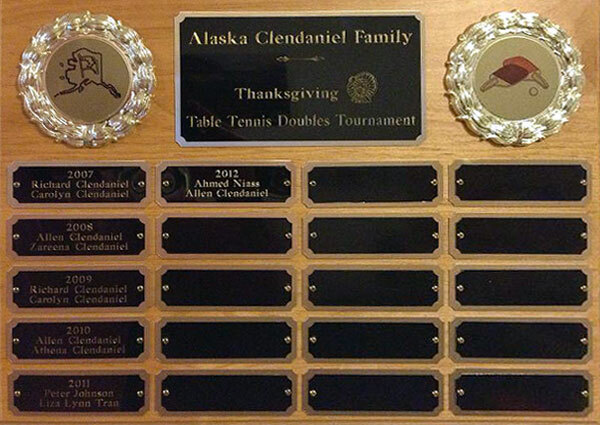 Every year my family has a Thanksgiving ping pong doubles tournament and the winners’ names get engraved on a special plaque that my brother hangs in his rumpus room. Maria and I had been practicing all week at home on our little end tables, which I had modified to be the height of competition pong tables. This really helped with improving our accuracy. Since it is a doubles tournament, I partnered with my niece and Maria partnered with my nephew. Although my brother and sister won the tournament, I think my practicing really helped my game. 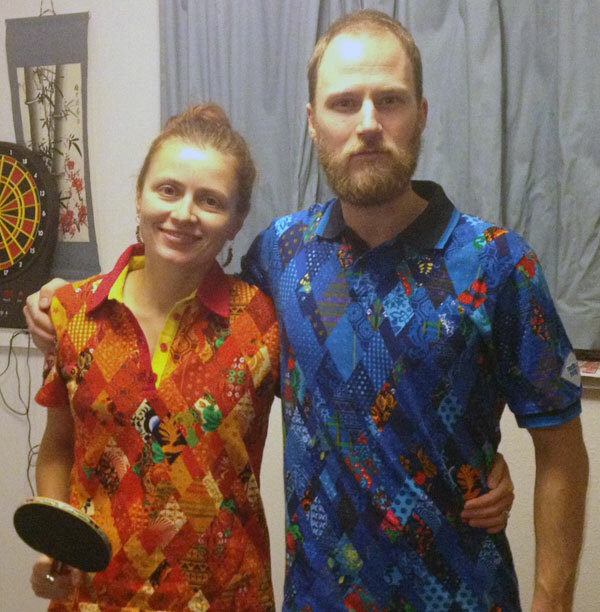 Maria and I donned our official 2014 Sochi Olympics polo shirts, just to get in the competitive spirit. Our niece and nephew are in Russian immersion grade school and really thought that was cool. It was truly a fantastic Thanksgiving! 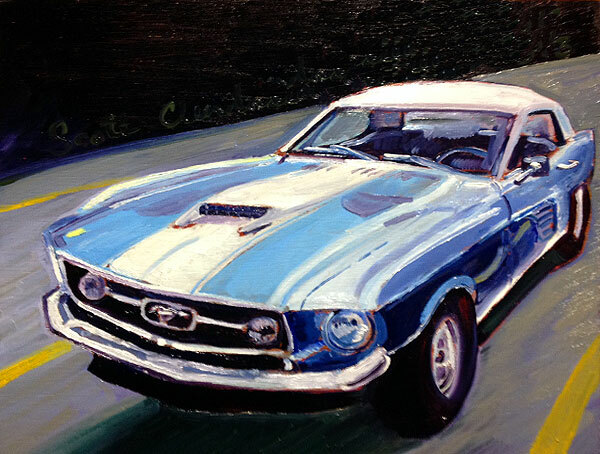 This entry was posted in Antique Autos and tagged mustang, ping pong, Thanksgiving on November 29, 2013 by realartisbetter. An art print of this painting is available at my online shop. The original sold. 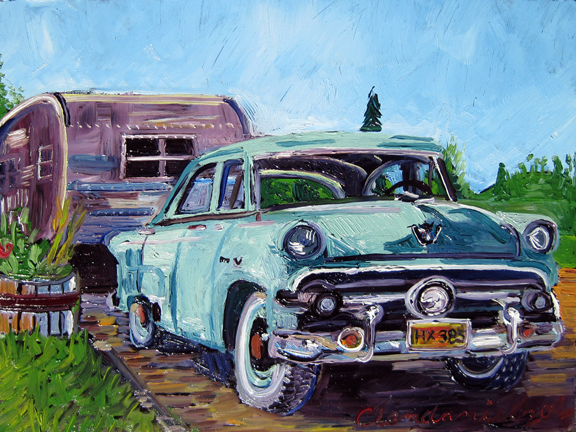 This entry was posted in Antique Autos and tagged airstream painting, antique auto painting, Antique ford painting, art for boy's room, painting for boy's room, painting of car, plein air painting, scott clendaniel on August 29, 2012 by realartisbetter. An art print of this painting is for sale at my online shop. The original sold. Saturday, Jason Lobo was out of town so he asked Maria (my wife) to stop by to feed his various animals. He has two horses, two goats, a pig, a turkey, and a kitty cat. The horses took some hay, while the rest of the animals, minus the cat, took some green pellet animal feed, even the turkey. 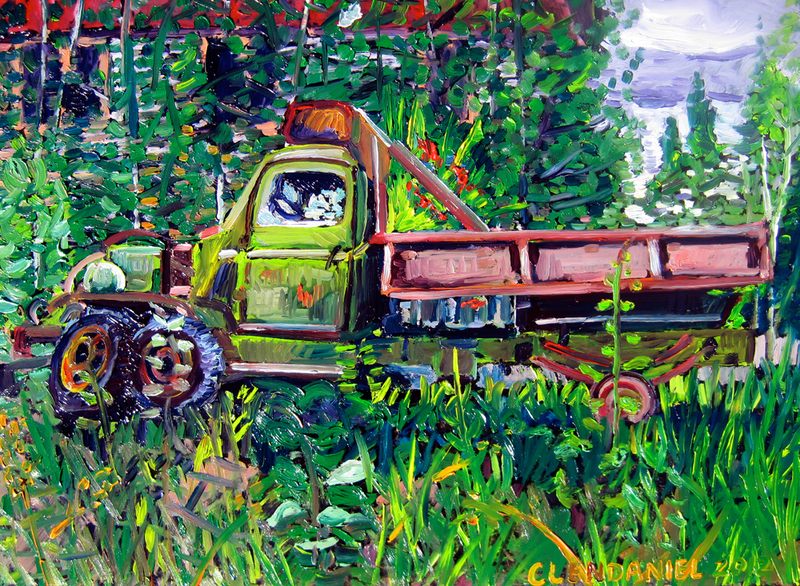 While Maria was searching for the pellet feed and cat food, I was painting this portrait of Lobo’s red truck. Jason lives about a mile from our house and on the same road, the Sandstone trail, so if he needs to go to McCarthy he has to drive past our home out there. It always seems that I am headed to town at the same time as Jason Lobo, which is very interesting, because normally he has all of his animals with him. Just last week he was driving this truck, (without the animals) and he was using gravity to propel him down the hill (it’s all down hill from where I live out there). We were on our way into town and jumped on the Jason Train! First time jumping into a moving vehicle since my high school days! MXY is always an adventure! 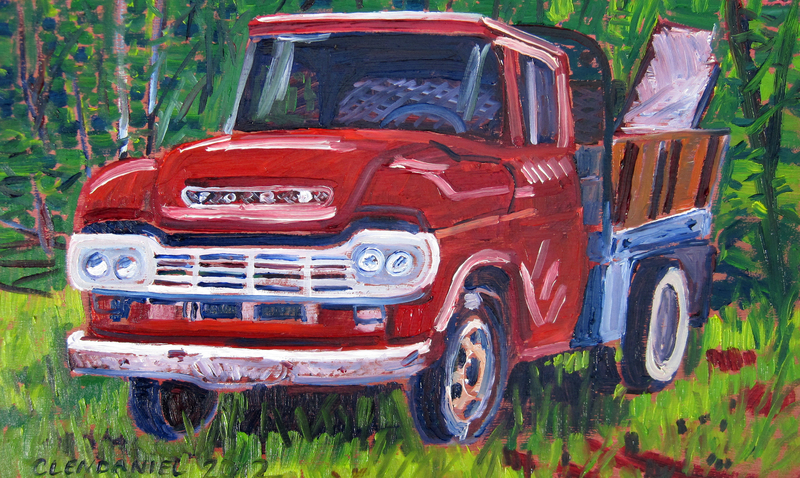 This entry was posted in Antique Autos and tagged antique ford truck painting, art for boy's room, painting for boy's room, plein air painting, red ford painting, red ford truck painting, scott clendaniel, truck painting on August 27, 2012 by realartisbetter. An art print of this painting is available at my online store. The original is for sale at Dos Manos gallery in Anchorage, AK. I have been working on these trucks now for a week! I love them! I think I will be incorporating them in my next big show of the year at the Midnight Sun Brewing Co. Loft. I look forward to putting some growlers with the trucks maybe… So the old green truck is a MXY fixture that has been obviously turned into a public sculpture and garden planter. It is a testament to the sweat and labor McCarthy residents of the past have endured. The GMC is just plain (plein) sweet! I wish I had that truck although I may pass on the fastback because as an artist I always need to haul plywood. I hope you enjoy these as much as I have! 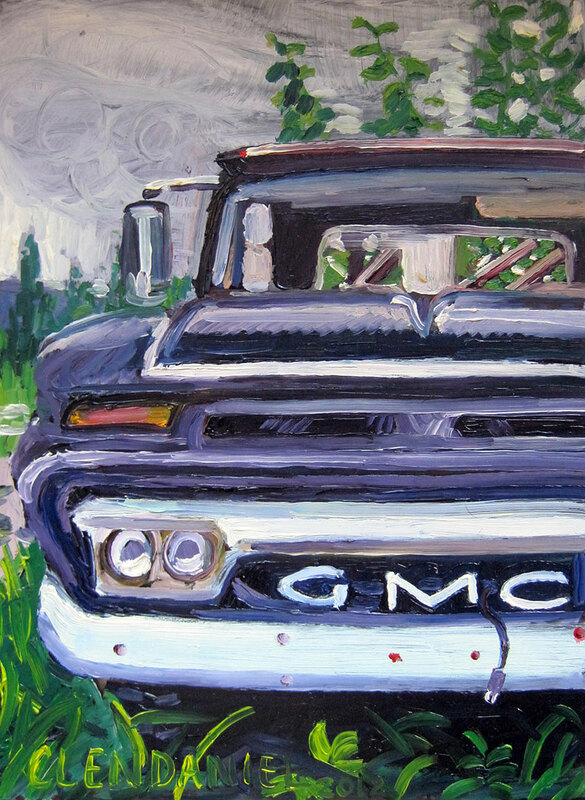 This entry was posted in Antique Autos and tagged antique GMC truck painting, art for a boy's room, black GMC truck painting, painting for boy's room, plein air painting, scott clendaniel on August 22, 2012 by realartisbetter. An art print of this painting is available at my online shop. The original is for sale at Dos Manos gallery in Anchorage. These three trucks are resting on Shushana Ave. in McCarthy, Alaska. I know the red one runs, probably all three run. The red Ford arrived this year and is in the possession of Mark Wacht, a local resident. As for the other two they have been there since I started coming to WSENP in 2005. Maybe somebody knows and I will fill you in on whose they are, and what they need to become mobile vehicles again. 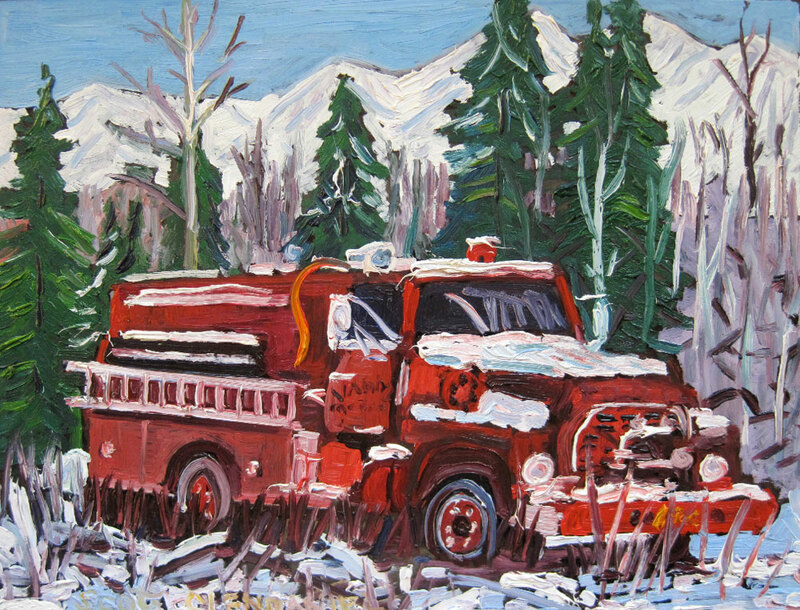 This entry was posted in Antique Autos and tagged Antique trucks in Alaska painting, art for boy's room, painting for boy's room, plein air painting, scott clendaniel, three trucks painting on August 20, 2012 by realartisbetter.